Several big and powerful blogs are making use of multiple author system on their WordPress powered websites. These include Mashable, Techcrunch, GigaOM and the list goes on. However Multiple Author blogging is no more limited to big blogs or big publishing houses. Small bloggers or small website owners who are looking forward for expansion are also turning towards multiple author blogging. But to run a blog with multiple authors working across different locations, you need to rely on a dependable and an extremely powerful source. WordPress is one stop solution for these growing bloggers. WordPress though an extremely powerful tool, is a bit limited in functionality when it comes to managing a proper editorial team, since its primary target audience was small time bloggers or small web site web masters. You can however enhance the efficiency of your WordPress powered blog/website by making use of the below mentioned easily accessible plugins, which would undoubtedly help you to maximize your WordPress multiple author environment. The ContentCloud WordPress plugin developed by Betaout as a SaaS (Software as a Service) provides a one stop solution for all editorial websites by offering a simple solution to handle editorial project management for multiple authors. The content cloud plugin helps in creating a smooth workflow by enabling editorial management using a single interface simplifying editorial project management in a user friendly manner. Based on plug and play architecture, the content cloud plugin allows editors to create and assign assignments to respective authors, managing deadline notifications enabling in a smooth individual centric workflow mechanism. 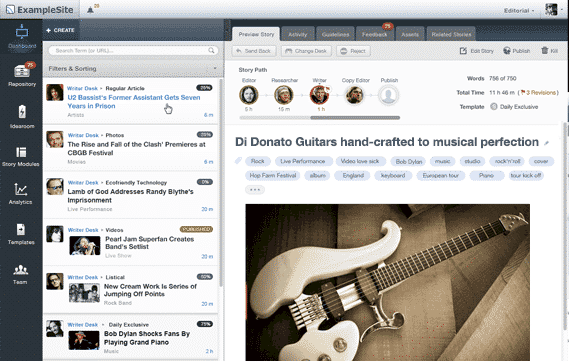 The unique and powerful features of the plugin allow administrators to manage editorial teams using the same interface on multiple WordPress enabled websites. Thanks to its easy integration module that enabling multiple desk workflows to manage writers as well as publication editors. Edit Flow plugin helps to empower me in networking with my editorial team I have within my WordPress platform. Owing to the modular format found in Edit Flow, I have the choice in customizing it as per my requirements. It has different features, which help me in my day to day editing and publishing activities and supporting me to assign work to my team members. The Calendar in the plugin helps me to look at my content as per the monthly order. Using the feature Custom Statuses, I can define all the important stages in my workflow. The Editorial Comments feature helps in carrying out private communication between writers and editors. The Editorial Metadata helps me in monitoring on all the essential details. The Notifications feature helps me in getting apt updates over the content, which I often have to follow. The Story budget helps me in checking all the upcoming posts in a proper traditional story budget view, I can carry its printout in my planning meeting as well. The User Groups feature helps me in managing all my users by function or relevant department. In short, Edit Flow plugin helps me in making my team collaborating tasks hassle free and quick found with my WordPress network. Content Progress plugin helps in adding different icons over posts, custom post and pages types along with checking whether my document is complete or not. Though Content Progress may not know if the page is simply laid out but it informs me regarding the presence of content over the page, and in case if there is no content, it simply flags it as empty. Moreover, in case if it has a small amount of content over the page, that particular document is simply flagged as partial. In this way, the editors can flag the relevant document as incomplete, which requires a recheck despite of any type of content present over the page. It also helps me in communicating with my team mates by adding notes over every individual post. In this way, I can quickly scan all the documents and find out the finished and incomplete ones. You can also find four different short codes, which are available for developing front facing lists of pages including incomplete, partial, empty and need review. These things help me in producing suitable unordered document lists. All the short codes simply accept the argument for the said post type. For instance, empty type = post. In this way, Content Progress helps me in expediting all my editing tasks in an easy to instant manner. Approval Workflow is one of the most widely used multiple authored website specific plugin that improves the workflow progress of multiple authored websites based on the WordPress publishing platform. The Approval workflow plugin allows verification of users for various publishing and administrative rights for their respective articles or posts with the addition of a box at the post edit screen. Approval Workflow improves the publishing workflow mechanism by allowing successful verification of rights of each user wanting to publish a specific webpage or web content article while notifying the author with publishing rights once a post has been submitted successfully to the workflow. The plugin use automation email technique to email the user with publication rights and works just as well on WordPress enabled multiples websites. The plugin uses its intrinsic intelligently designed module of hunting down the user with publication rights as soon as any new submissions are made on the workflow desk thereby helping in cutting out any time discrepancies in submission and publication. Since the plugin sends automated emails to all users with publishing rights after every submission, all users with publication rights are kept in the loop of any new publication process and user submission modules. Approval workflow plugin works equally efficiently with all WordPress multisite and allows comparison of new and old pages in the plugin dashboard. Post Revision Workflow is a very useful WordPress plugin that allows successful revision of any published content on the WordPress based website or blog without the revising the published content in real time. The plugin works in a user friendly as well as publisher friendly manner without altering the original published content. The plugin provides editing or revision options in its publish Meta box and all changes are saved as a revision text and posted without altering the workflow of the original content. There is no one size fits all revision process in the post revision workflow plugin. In fact the plugin offers dynamic revision options from saving revised changes without notification to saving revised content to automatically publish revised changes while announcing the changes to the reviewer or publisher as per the workflow of the website. The only thing amiss in the post revision workflow plugin is its inability to send notifications to users on its own accord. Since the plugin is newly developed, the future versions may offer a better solution as far as notification is concerned. Overall compared to the effectiveness of the plugin to revise content successfully and to allowing revision of published content in a user friendly manner and a clean interface, the notification issue can surely be overlooked without much concern. The post revision plugin also has multiple installation options allowing usage either as a standalone plugin or over network without any hassle. These five plugins maximized my WordPress Multi Author Environment. Try them and let me know about your favorite plugin. Five ways to save time with content marketing How to save time with content marketing so you can produce more content in less time. Five easy steps.